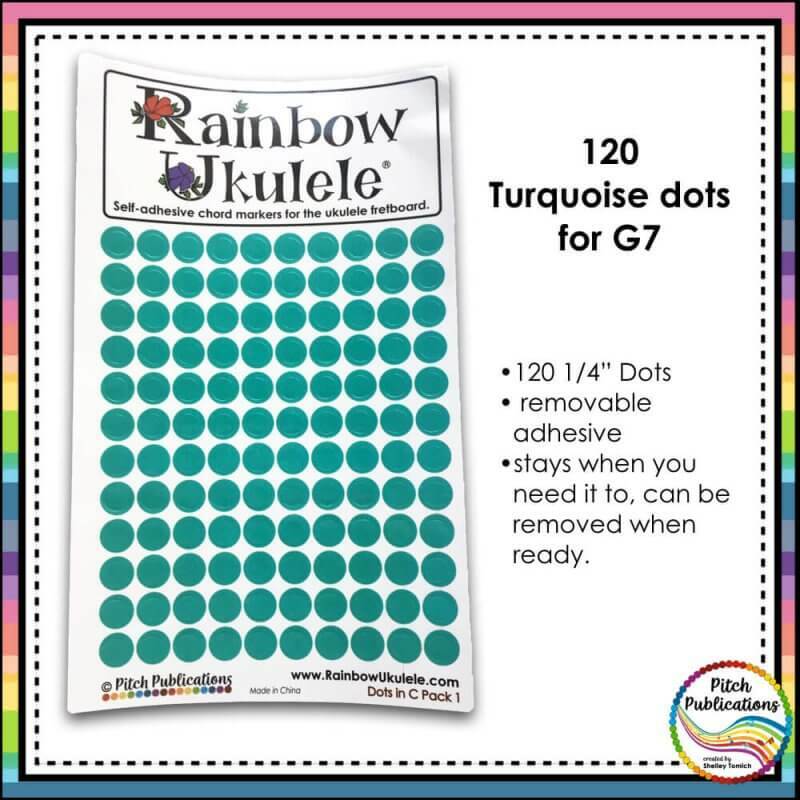 Colorful, removable self-adhesive dot stickers to match the Rainbow Ukulele program. 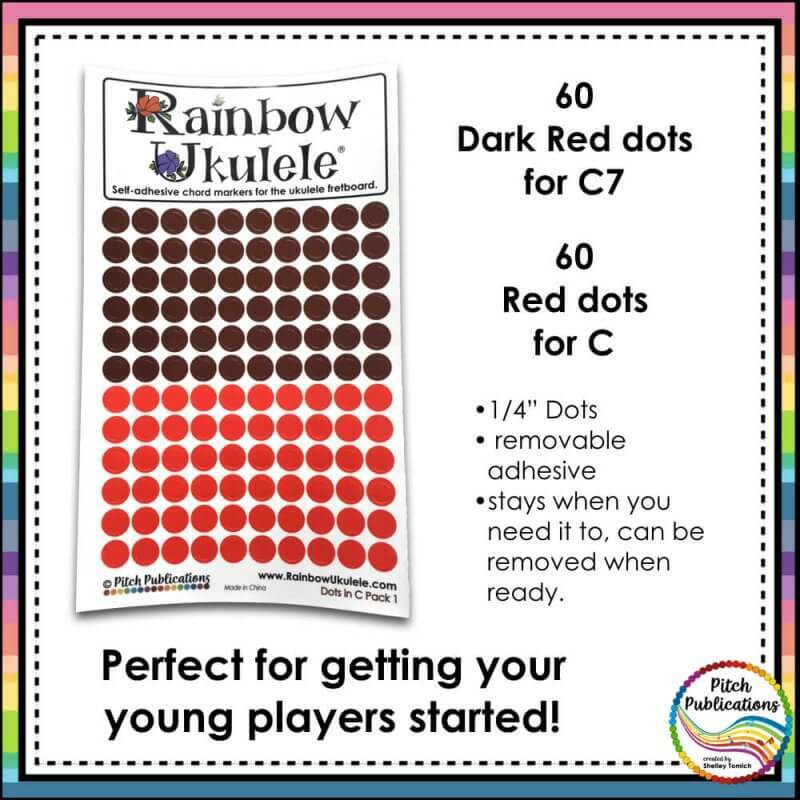 One set provides enough stickers to mark C7, C, G7, and F for 40 ukuleles. You will receive enough stickers to mark your C7, C, G7, and F chord to match the Rainbow Ukulele teaching method. Stays on the ukulele, even with multiple student use. Can be peeled off without leaving a mark when you are done with the dots. Printed on high quality, coated stock. 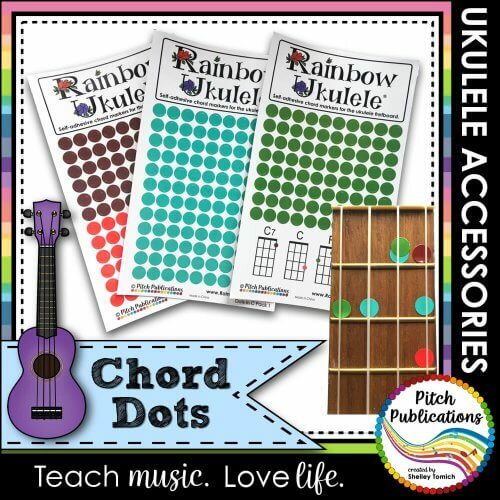 Why use stickers for teaching ukulele? Learning to play the ukulele requires a lot of mental skill and fine motor skills. Often, elementary aged children mental abilities are greater than their fine motor abilities when learning to play a string instrument. This can lead to a lot of frustration when a child knows what to do but is unable to accomplish it. 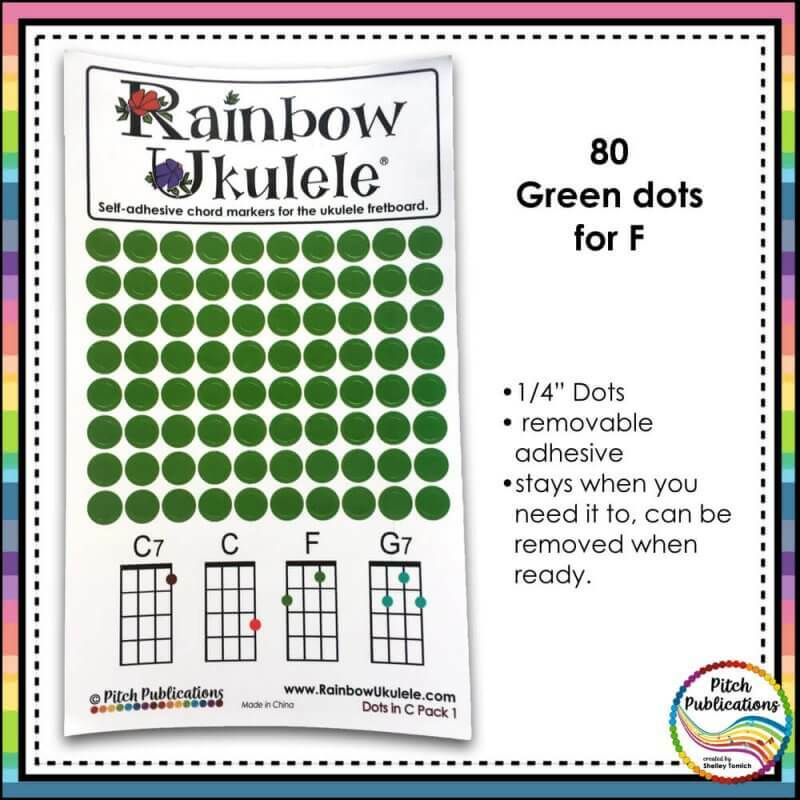 Colored dot stickers provide something concrete for the students to use when learning chord shapes. 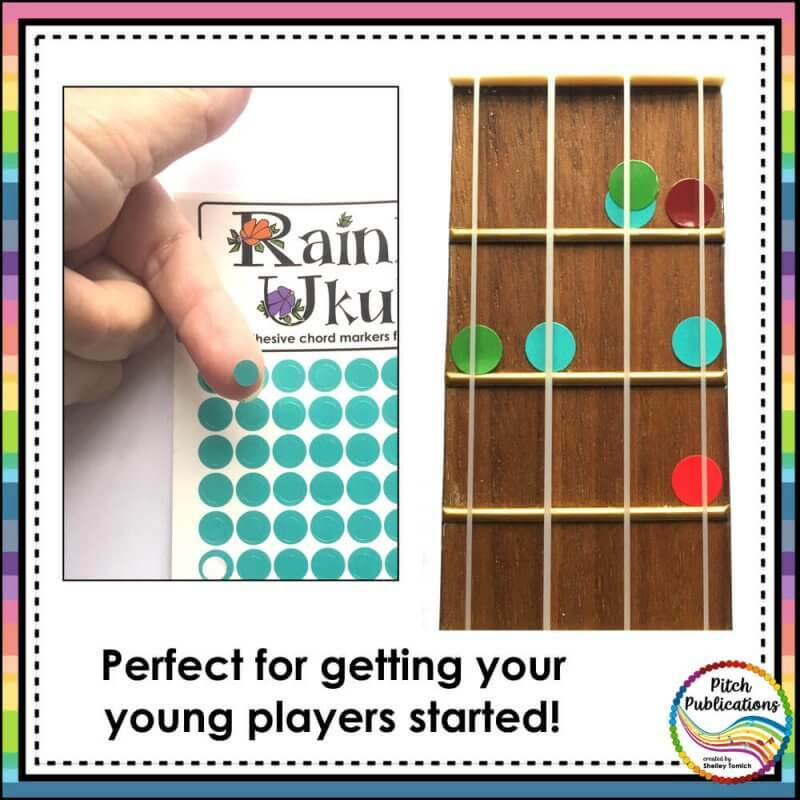 After using the colored dots for a few weeks, the children’s muscle memories will take over and they can use these chord shapes without the dots and/or apply them to other chords. In addition, the colors provide an easy visual cue for changing chords within a song. Shelley was so easy to work with. When my stickers got stuck in the mail, she got a new set for me right away. I just put them on the ukuleles and they are perfect! Thank you so much, Kendra!! :). Sorry about the mail mixup and so glad they are working for you!!! They work great!! They really help my students. These are great! Easy to put on and take off! Wahoo! So glad you like them! :). Thanks for the feedback! These really came in handy and gave the kids confidence when learning their first chords! They already had enough to think about when moving their fingers and then adding strumming, so being able to glance down before a chord change and see where your fingers need to go really helped speed up the learning process! Only request is that you add the navy dots for Am chords too, since the book I use taught Am way before C7. Hey Joelle! Thanks for the review 🙂 . I hope to have another set of dots available soon! I love them! 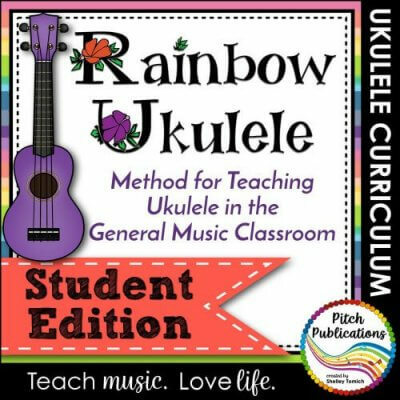 It’s the best method for my students to learn uke. Thank you for also providing these dots. Thank you so much, Karen!! :). So glad they have been helpful to you and your students! They’re so easy to use and help the kids so much! These are amazing! Thank you so much. 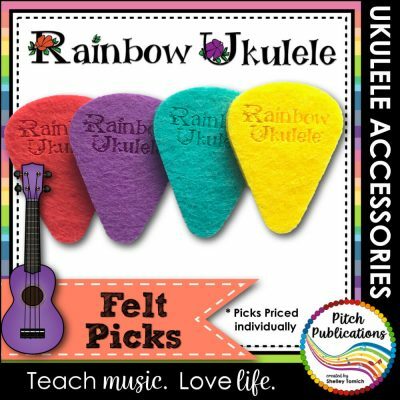 I use them for my ukulele lessons; they have made my job much easier. Wonderful! Thanks for the feedback, Susan! These are fantastic! Especially for my students who need extra help with coordination! Yay! So glad these were helpful!! They work great and are very helpful for the students! 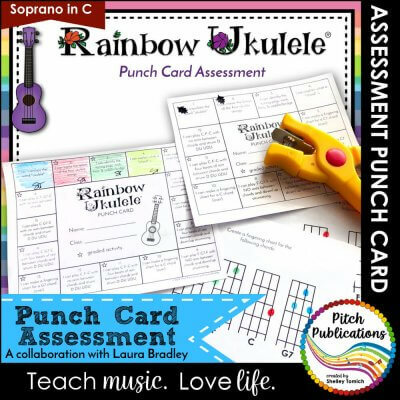 I bought a set of these for the ukulele that I had already purchased for my niece to make it easier for her to learn to play. I’ve never played an instrument before but I set it up myself and played every song in the book – it was so fun and easy! 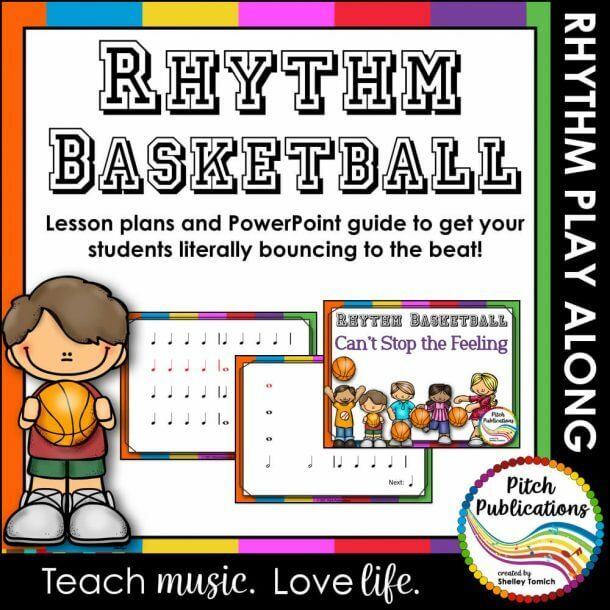 Do the colors of the chord dots match Boomwhacker note colors? i.e. is C red, etc.? Notes about the shades vs. boomwhackers – Both C’s are in the red family, but I wanted to differentiate between C and C7. I tell kids that if they see red at all, play the red boomwhacker! The F dots are a darker green than boomwhackers. 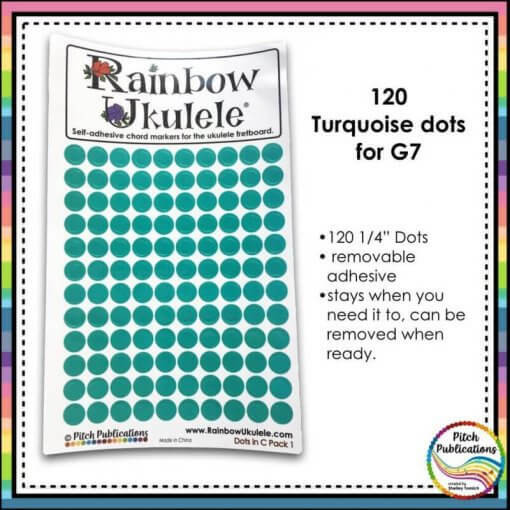 The G7 turquoise dots are lighter than the boomwhacker.